1657: John Watts and Catherine his wife bought from Samuel Rawlins the elder and younger and Edward Mitchell (the mortgagee) a "cottage" which they then mortgaged to Samuel the elder for £200. It had barns, stables, backsides, orchard and gardens. No location is given but it was probably 6 HIgh Street. 1664: John Watts produced his own trade tokens (right). 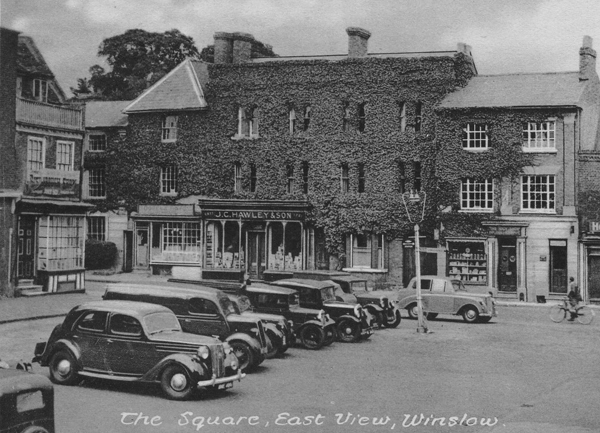 He lived in Winslow from at least 1642, but we don't know whether it was always at 6 High Street. 1692: Will of John Watts, ironmonger, proved at Winslow, 16 Dec. The inventory has goods worth about £170 in the shop, warehouse, back chamber and backhouses. The will does not mention any premises, which must have passed to his oldest son William. Catharine Watts widow surrendered a messuage now in the occupation of herself and Thomas Watts or either of them. To the use of Catherine for her life, then to Thomas in perpetuity. Rent 6d, fine 5s, heriot [blank]. 1710: Will of Katherine Watts, widow, proved at London, 23 Dec.
She gave her son William a strong incentive to transfer to his brother Thomas "that Messuage or Tenement now in the tenure or occupacon of me the said Katherine Watts scituate in or near the Market Place of Winslowe" . 1725: Will of Thomas Watts, ironmonger, proved at London, 3 Aug. He left to his nephew John Watts "my Copyhold Messuage or Tenement wherein I now dwell with all the Outhouses Barns Stables Yards Orchards Gardens backsides privelleges and appurtenances" under certain conditions; if they were unfulfilled it would go instead to his nephew Peter Stutsbury. John Watts admitted as tenant. A deleted entry records him transferring the property to Peter Stuchbury. 1742: Will of Peter Stuchbury, ironmonger, proved at London, 11 Jan. He left to his nephew Henry Stuchbury "All that my Copyhold Messuage or Tenement in Winslowe aforesaid wherein I now dwell And the Outhouses Barnes Stables Yards Orchards Gardens Backsides Priviledges and Appurtenances". 1750: Will of Henry Stuchbury, ironmonger, proved at St Albans, 24 Oct. There is an extremely detailed inventory which mentions the shop, three warehouses (upper, lower and next to the shop) and the butchers' workshop. The stock was worth about £300. He left to his father Henry Stuchbury "All that my Copyhold Messuge or Tenement in Winslow ... now in my own Occupation together with the Shop Yard Garden Stable and all other out Buildings thereto belonging". 1750: John Deverell borrowed £200 from John Watts of Stony Stratford, ironmonger (who inherited the premises in 1725), presumably to buy Henry Stuchbury's business. The principal sum was repaid by John Deverell's widow Avis in 1769, and recorded in the manor court book for 1770. There are a number of longcase clocks in existence made by John Deverell of Winslow (see photo on right and click here for some more), who bought 6 High Street from the Stuchburys. Charles King, clock and watch-maker (b.1748), later operated from premises which were probably behind 6 High Street and certainly belonged to the Deverells (see below). 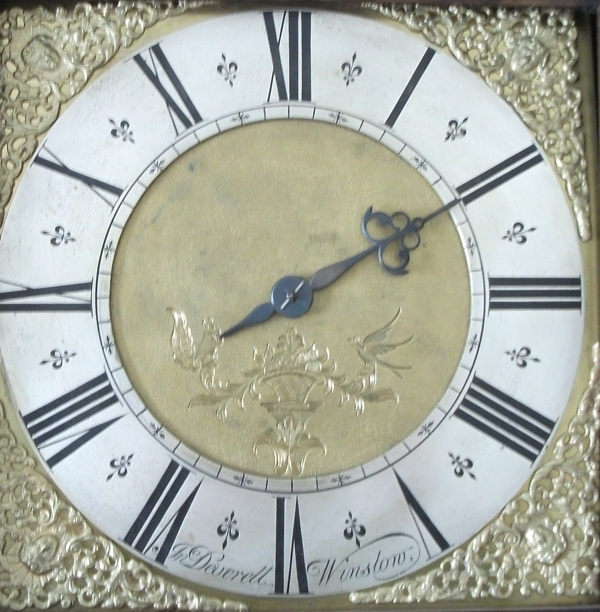 It seems likely that John Deverell branched out into clock-making (he did not necessarily do the work himself), and after his death the businesses separated. 1758: Will of John Deverell of Winslow, ironmonger, proved at the PCC, 30 Sep.
His wife Avis was to sell off all his property to pay off the mortgages and other debts, and to pay his son Josias £500. Marriage bond of Josiah Deverell, tallow-chandler of Winslow, and Elizabeth Fowler of Aylesbury. Decease of Avis Deverell, widow; admission of her son Josiah under her will dated 6 Feb 1776 to "copyhold messuage ... near the Market Square of Winslow ... heretofore in the Occupation of Henry Stutchbury deceased and late in the Occupation of the said Avis Deverell and now in the tenure or Occupation of Josiah Deverell"
Josiah Deverell of Winslow Grocer & Tallow Chandler and Elizabeth his wife mortgaged this and other property to Thomas Taylor of Swanbourne Carpenter & Joiner for £150 payable on 1 Jan next. Lot 1. 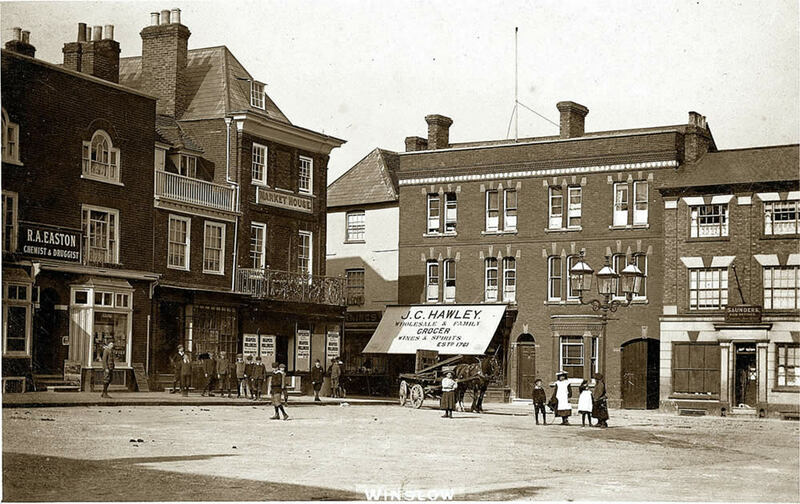 A COPYHOLD MESSUAGE or TENEMENT, situate in the Market-Square of Winslow aforesaid; together with all the Stock, Counters, Shelves, Shew-Glasses and Utensils in Trade of the said Josiah Deverell. The house and Shop has been in the Trade of an Ironmonger upwards of	50 Years, and has a large Yard adjoining to it, with exceeding good conveniencies for carrying on the Trade of a Grocer, Tallow-Chandler, and Soap-Boiler; there is likewise a very convenient new-built Brewhouse at the Upper End of the Yard, with a Drying-Room and Laundry over the same, and a neat Garden walled round. a very reasonable Price, to any Person who will buy the same. Lot 4. A FREEHOLD Inclosed close of Pasture-Ground, with a new Cow-House erected thereon, situate in the Parish of Grandborough, in the County of Bucks, containing by Estimation six Acres, more or less, now lett to John Clarke, of Winslow aforesaid, Carrier, at the yearly Rent of 7l. 10s. upon a Lease for 21 Years, 14 Years of which are already expired. For further Particulars, or to treat for either of the above Lots, apply to Mr. John Axford, Grocer, on Ludgate-Hill, London; Mr. John Clinton, Grocer, in Aldersgate-Street, London; or to James Burnham, Attorney at Law, in Winslow aforesaid, who will shew the Premises. ALL Persons who have any Demands on the Estate and Effects of JOSIAH DEVERELL, of Winslow, in the County of Bucks, Ironmonger, Grocer, and Tallow-Chandler, are desired to send an Account thereof immediately to James Burnham, Attorney at Law, in Winslow aforesaid. And all Persons who stand indebted to the said Estate are requested to pay their respective Debts to the said James Burnham, on or before the 17th Day of August next, otherwise they will be sued for the same without further Notice. All the entire STOCK in TRADE of JOSIAH DEVERELL, of Winslow, in the County of Bucks, Ironmonger, Grocer, and Tallow-Chandler; consisting of Grocery, great Variety of Ironmongery and Cutlery Goods --- Likewise two COPYHOLD MESSUAGES, or TENEMENTS, (Fine certain Five Shillings each upon Death or Alienation) situate in the Market-Square of Winslow aforesaid, one of which is now in the Occupation of the said Josiah Deverell, and has been an old-accustomed Ironmonger's Shop for 50 Years and upwards, with a large Yard, Garden, and exceeding good Out-Offices belonging to the same; and the other in the Occupation of Charles King, Watch-maker, with an exceeding good Stable, Out-Houses, and a large and commodious Work-Shop thereto belonging. Also the HOUSEHOLD-GOODS and FURNITURE of the said JOSIAH DEVERELL; consisting of very good Feather Beds, Blankets, Quilts, Bedsteads, &c. with Harrateen Furniture; Mahogany Chairs, Tables, and Chests of Drawers; Pier and Dressing-Glasses; Pewter, Brass, and Kitchen-Furniture; together with Brewing and Washing-Coppers, Brewing-Vessels, &c.
The Whole of the Household-Goods and Stock may be viewed the Day before the Sale; and Catalogues thereof will be delivered gratis, in due Time, at the George Inn, in Aylesbury; the Cross-Keys Inn, in Buckingham; the King's-Arms Inn, in Bicester; the Three-Swans Inn, in Stony-Stratford; and at the Place of Sale. All that Copyhold Messuage of Tenement situate standing and being near the Market Square of Winslow aforesaid heretofore in the occupation of Henry Stutchbury deceased late in the occupation of the said Josiah Deverell and now in the occupation of Thomas King. Ann Dodd of Quainton widow acknowledged receipt of £200 from Josiah Deverell as Avis' only son and executor, through Thomas King the elder. Thomas Taylor of Swanbourne acknowledged receipt of £150. cupation of Mr. THOMAS KING, who is retiring from Business. well stocked with fine young Fruit Trees. Fifteen Miles of the Place. Thomas King late of Blackthorne yeoman held by rent of 7d among other things a messuage in the Market Square late in the occupation of Thomas King, now of George Hawley. He died since the last court. Thomas King of Winslow grocer his eldest son desires to be admitted tenant. GEORGE HAWLEY, having Entered upon the Stock in Trade of Mr. THOMAS KING, IRONMONGER, GROCER, and CHANDLER, begs the Continuance of the Favours of the former Customers, and the Public at large, who may rely on being served with the best of Goods on the most reasonable Terms. N.B. Mr KING returns Thanks to his numerous Customers, and shall consider their Orders given to his Successor, as Favours conferred upon himself. 1805: Land Tax – George Hawley (owner & occupier) self, 8s. 11d. 1832: Land Tax – George Hawley: house etc., 8s. 11d. James Hawley sr moved to Adstock Manor as a farmer: in 1871 he had 170 acres and employed 7 men and 7 boys. 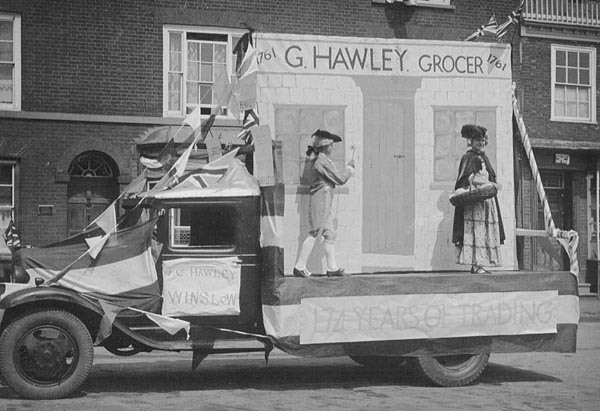 Dissolution of partnership: George James Hawley and James Caleb Hawley, trading as G. and J. Hawley, Winslow, Bucks, grocers. The premises were rebuilt in the 1880s in the form which still survives above ground-floor level. We don't know what they looked like before. 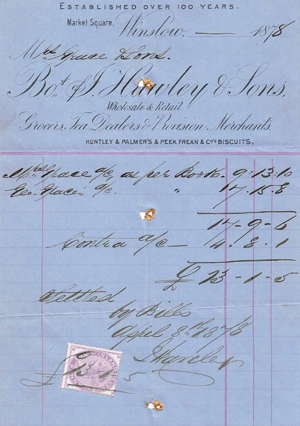 In 1901 George Hawley was a "tea trade clerk" living as a lodger in Sedgwick Road, Leyton, London. James Caleb Hawley, grocer & agent for W. & A. Gilbey, wine and spirit merchants. 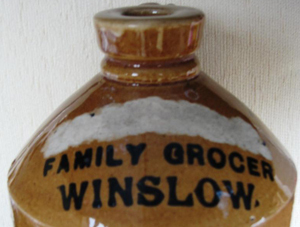 The stoneware flagon (right), made by Price of Bristol, with the name scratched out, originally said "J.C. Hawley". As J.C. Hawley started adding "& Son" from about 1913, it probably dates to before then. 1932: Death of James Hawley, aged 81, on 9 Sep.
1954: Death of Leslie J. Hawley, aged 66. After Leslie Hawley's death, the shop became part of a small chain of supermarkets called Dudeney and Johnston, who changed the frontage. It is now (2015) One Stop. The photo above shows it after the demolition of 27 Market Square in 1948 but before the alterations to the building. 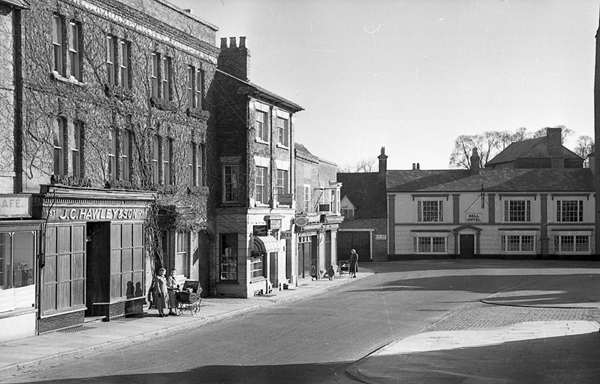 The photo below (provided by Michael Leonard) was taken in 1952 and shows it from a different angle.